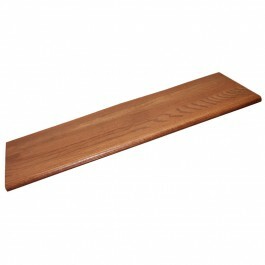 Red Oak Gunstock Retro Stair Tread Closed 42" wide - Prefinished and ready to install - No staining or finishing required. Red Oak Gunstock Retro Stair Tread Closed 11.5 in wide x 42 in long - shipped pre-stained in Gunstock and then finished with our UV Cured Diamond Coat II - ready to be cut-to-size and installed as soon as you receive them. All our products are edge glued treads opposed to a 'one piece tread' or a tread made from a single 'slab' or piece of wood. Having an 'edge glued tread' or a step with 'multiple pieces' is an industry standard and is the preferred method of manufacturing by most stair tread manufacturers. The glue bond on an edge glued tread is actually stronger than the wood itself and we guarantee our treads for life against any wood separation or glue failure. There are two main types of tread on the market today: edge glued (like ours), and engineered. Engineered treads have some type of wood core material that is edge glued (like our treads), and then a thin veneer is glued on top of the edge-glued panel in the desired species. There are a lot of drawbacks to the engineered tread (too many to mention here) and the only real benefit may be cost. There aren't many people who make a 'one piece tread' and if you do find them, be very cautions before buying, especially with the relatively humidity level in your area. The 'single piece' treads are very prone to warping, cupping, end checking and a host of other problems. Having multiple 'pieces' (more technically called 'staves') in one tread greatly reduce the possibility of warping and cupping over time. 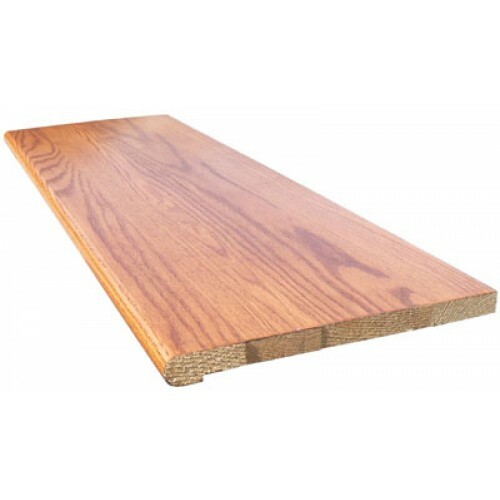 There isn't a bevel or any space between the individual boards so once installed, they blend very nicely with any hardwood flooring. We use color and grain-matched wood to assemble our treads so, picking out an individual board is usually rather difficult. Do you have a product that works for a curving stairway and is 13" deep at the widest end? We do not make wide treads in the retro profile. We can make wide treads in the 1" thick traditional treads though. You can email the number of treads and the length with the shipping zip code into sales@stair-treads.com and a sales representative will be happy to get a quote made and emailed over to you! The treads will be blanks, that will have to be cut to fit on site. Got my sample kit today, looks fine. Are the treads flat or do they have a lip that hangs over the face. Are the treads finishes on both sides? These treads do have a bullnose (lip) that is 1" thick and the body of the retro treads is 3/4" thick. The treads are only finished on the one side and the bullnose for closed treads. My staircase is open to the left side. 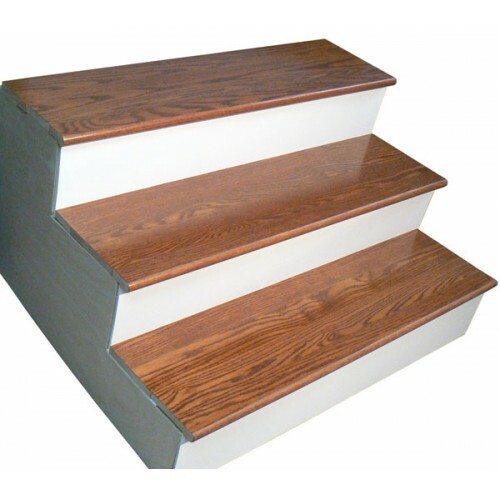 do you make a stair tread with a bullnose corner and side? Here is the link to our Left Return Gunstock Treads - They have the bullnose on the front and left side of the tread for open staircases! 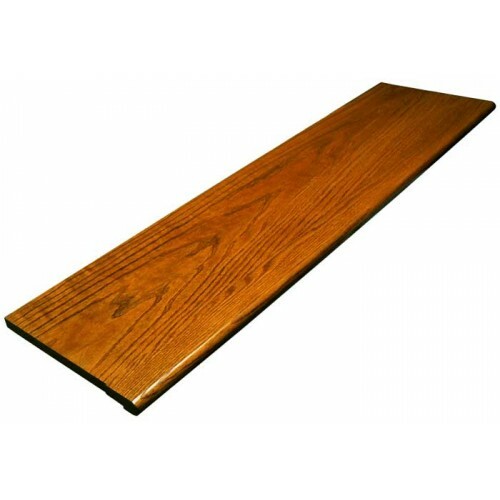 If we can assist you further please contact us at 866-429-0979 x 1 or email us at sales@stair-treads.com!